Who Actually Represents American Muslims? Activists participating in CAIR's lobby day included Abdullah Faaruuq, a Muslim cleric, who, in response to the arrest of Al Qaeda operative Aafia Siddiqui, told Muslims to "grab onto the gun and the sword and go out and do your job." "[CAIR] is a Muslim Brotherhood front organization. It works in the United States as a lobby against radio, television and print media journalists who dare to produce anything about Islam that is at variance with their fundamental agenda. CAIR opposes diversity in Islam." -- Sheikh Abdul Hadi Palazzi, Muslim cleric and secretary general of the Italian Muslim Assembly. Very few American Muslims seem to feel that CAIR is a legitimate voice for American Islam. According to a 2011 Gallup poll, about 88% of American Muslims said that CAIR does not represent them. CAIR has been denounced by anti-racism groups, the federal government and by other Muslims. When legislators meet with CAIR, they help CAIR impose itself upon Muslim communities as a self-declared representative. On November 12, 2015, the Council on American Islamic Relations (CAIR), with the support of a number of local Islamic groups in Boston, organized a lobbying day at the Massachusetts State House, ostensibly to advocate on behalf of local Muslims. Nadeem Mazen, a director of CAIR's Massachusetts branch (CAIR-MA) and an elected councillor for the city of Cambridge, explained: "We must be thought leaders and exemplars in our communities for basic social justice. And we're meeting with our legislators to remind them that we are hundreds, thousands, and in many cases tens of thousands strong in their communities." Certainly, the discussions that took place fit the "social justice" narrative – the Boston Globe reports that participants argued for "increasing affordable housing, reforming school discipline, and reducing mass incarceration for non-violent offenders." But who exactly was behind this lobbying day? And what does it mean for American Muslims that such groups claim to represent their interests in state legislatures? The chief organizing body, the Council on American-Islamic Relations, is a prominent Islamic group, but which has a long history of involvement with extremist and terrorist causes. In 2009, during the Holy Land Foundation terror financing trial, U.S. District Court Judge Jorge Solis concluded that, "The government has produced ample evidence to establish the associations of CAIR... with the Islamic Association for Palestine, and with Hamas." During the trial, CAIR was designated an "unindicted co-conspirator." As a result of CAIR's apparent links to a terrorist movement, the Justice Department in 2009 announced a ban on working with CAIR. The FBI also severed relations. CAIR was founded in 1994 by three officials of the Islamic Association of Palestine, which, the Holy Land Foundation trial would later determine, was a prominent Hamas front group. One of CAIR's Islamic Association of Palestine founders, Nihad Awad, is today CAIR's Executive Director. The Anti-Defamation League notes that CAIR has long expressed anti-Semitic and pro-terror rhetoric, adding that, "[CAIR's] public statements cast Jews and Israelis as corrupt agents who control both foreign and domestic U.S. policy and are responsible for the persecution of Muslims in the U.S."
The other groups involved in the lobbying day included the Muslim Justice League, which campaigns against counter-terrorism initiatives; and MassMuslims, a Boston-based organization that claimed to promote civic engagement for the region's Muslims. Nadeem Mazen -- a councilor in Cambridge, a director of CAIR-MA and the chief architect of the lobby day -- founded MassMuslims in 2014. His group has promoted events with Omar Suleiman, a extremist preacher who describes homosexuality as a "disease" and a "repugnant shameless sin." In May, another MassMuslims official, Omar Khoshafa, invited the extremist preacher Yasir Qadhi to address students at Harvard. Qadhi has claimed that "Hitler never intended to mass-destroy the Jews," and that the Holocaust is "false propaganda." Khoshafa, who was quoted as a participant at the lobby day, describes Yasir Qadhi as "one of the foremost Muslim-American scholars and an amazing lecturer." Other activists involved with CAIR's lobby day included Abdullah Faaruuq, a Muslim cleric, who, in response to the arrest of the Al Qaeda operative, Aafia Siddiqui, told Muslims to "grab onto the gun and the sword and go out and do your job." 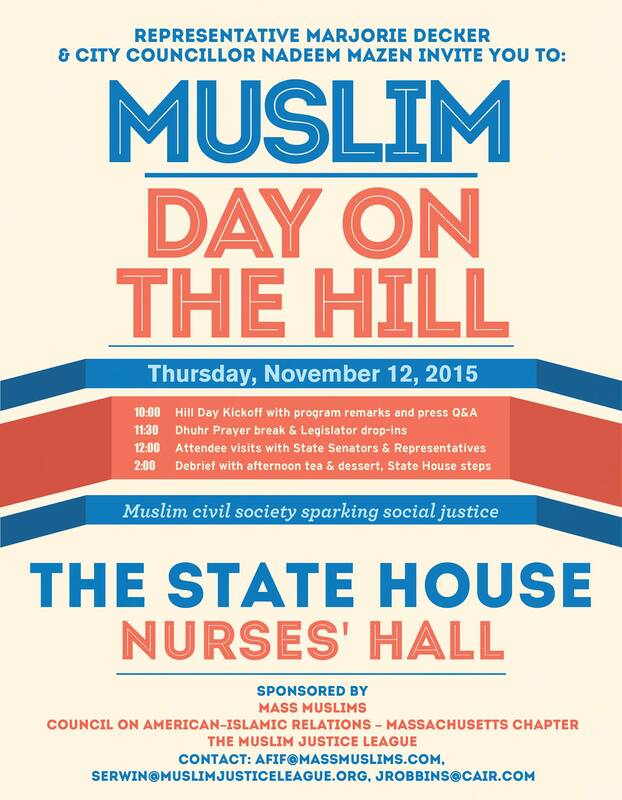 Abdullah Faaruuq, wearing a white skullcap, takes part in a Muslim "lobby day" at the Massachusetts State House. But do any of these extremist connections matter if the purpose is simply to involve Massachusetts Muslims in the democratic process? The lobbying topics may seem relatively benign -- affordable housing, school reform and prison incarceration rates. But a letter sent by the Boston-based Americans for Peace and Tolerance to all State Legislators, and signed by a number of prominent Muslims explained that, "CAIR's initial strategy is to assert itself as the political voice of Massachusetts Muslims by addressing some of the legitimate needs of the American Muslim community, but it will eventually be lobbying for the acceptance of a radical and hateful ideology, to the detriment of Massachusetts's historically moderate, integrated Muslim population and the greater Boston community." By purporting to advocate on behalf of Massachusetts Muslims, CAIR appears to be seeking credibility as a voice of American Islam. When legislators meet with CAIR, they help CAIR impose itself upon Muslim communities as their self-declared representatives. Very few American Muslims, however, seem to feel that CAIR is a legitimate ambassador for American Islam. According to a 2011 Gallup poll, about 88% of American Muslims said that CAIR does not represent them. Muslims all over the world, in fact, apparently do not think CAIR is a moderate or legitimate Muslim group: in 2014, the United Arab Emirates, a pious Muslim state, designated CAIR a terrorist organization, along with dozens of other Muslim Brotherhood organizations. In reality, American Muslims are extremely diverse, and no single group can claim to speak on their collective behalf. American Islam comprises dozens of different religious sects and political movements, many of which advocate distinctly different ideas. But for Islamist bodies such as CAIR, it suits their agenda if American Muslims are portrayed as a monolithic community. If American Muslims can be seen as homogenous, then a group such as CAIR has a better claim to represent their interests. Even CAIR's own research, however, undermines their claim to speak on behalf of American Muslims. A 2011 report reveals that a majority of American mosques are not affiliated with any American Islamic body. Addressing a conference in 2000, Sheikh Abdul Hadi Palazzi, a Muslim cleric and secretary general of the Italian Muslim Assembly, explained that, "[CAIR] is a Muslim Brotherhood front organization. It works in the United States as a lobby against radio, television and print media journalists who dare to produce anything about Islam that is at variance with their fundamental agenda. CAIR opposes diversity in Islam." In truth, CAIR only speaks on behalf of a small extremist ideology that, as discovered by federal prosecutors, emerged across the United States during the 1990s out of the Muslim Brotherhood and Hamas. 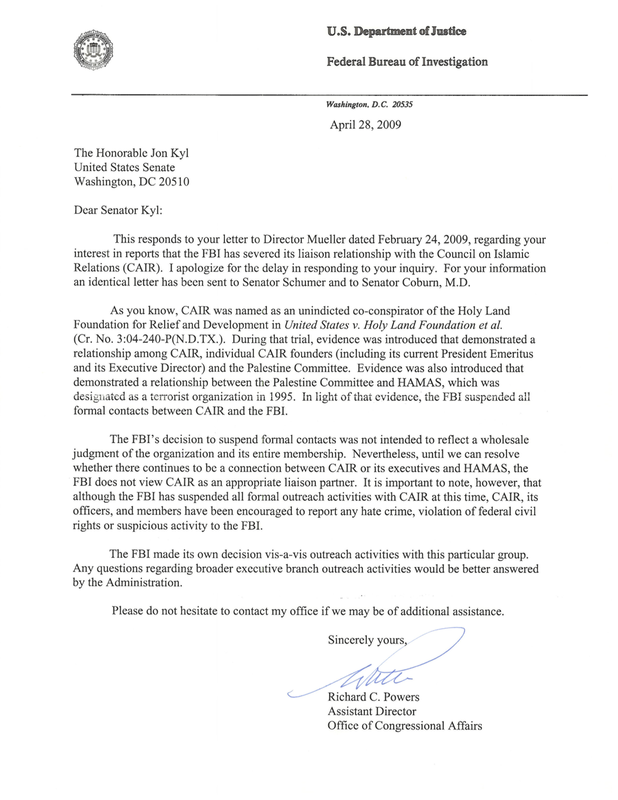 Although CAIR does not represent American Muslims, it managed, before the Holy Land Foundation terror trial in 2008, to persuade a great many people that it did. Enough time has passed that CAIR seems to believe it can try this move once again. CAIR has been denounced by anti-racism groups, the federal government and by other Muslims. Its activities in the Massachusetts State House appear to be part of a larger effort to rehabilitate its image in the eyes of politicians and journalists. While CAIR's preferred topics of discussion may seem benign is irrelevant, the real threat is one of legitimacy. If State Legislators continue to meet with CAIR and journalists continue to write puff pieces about CAIR's work, then we betray a worthy non-extremist Muslim majority while rewarding an extremist minority. Who represents America's Muslims? In truth, no one. And certainly not CAIR. 100% of Muslim Brotherhood members say CAIR does represent them. So there! Qadhi exclaimed to Harvard students that Hitler didn't intend to mass-destroy Jews and that the Holocaust was false propaganda. Qadhi's premise would add yet another failure to Hitler's dream of a Thousand Year Reich. Why only a thousand years anyway? Perhaps Hitler calculated by then there wouldn't be enough military age Germans to bring his dream into fruition. I'm surprised that Qadhi, with as much hate as he has on his mind, had to bring Hitler into the projection. However, since he did mention Hitler, the answer to Hitler not intending to destroy the Jews may have been a request by the Grand Mufti of Jerusalem, on leave of absence from his usual duties in order to recruit Balkan Muslims for Nazi SS units while he was Hitler's guest during WW2. The Mufti's request must have been to Hitler "Save some of them for us." That was the Grand Mufti,was always thinking of his cause. Now he, the Mufti, is gone just like Hitler went. But, those admirers of both Hitler and the Grand Mufti should not feel deserted. There are Hitler-types and Mufti-types on their ways to infamy. It seems the supply of them is never exhausted. Ethics without power is meaningless. The Jews had to wait a few thousand years. Moderate Muslims have the same predicament. No power, no money, no assets: NO INFLUENCE. This is the opposite of CAIR. The US Adm has shown NO interest whatsoever for moderate anything!!! Pew report: > 51% of US Muslims want Sharia law. How many used TAQIYYA? Might have been much more than 51%! Who knows? CAIR's tactics are consistent and aimed against the US and it's form of government. May I remind Gatestone that criticism of religion and ideology is legal in the US even if it is not legal in England or France. As I have explained to my daughters, criticism of religion is NOT racism. That is the demagoguery of the Muslims ("Islamophobia", word without meaning). It is not even illegal to be blasphemous (albeit distasteful), in the US. Anyone who supports a critic of Islam becomes a target of legal actions and outright slanders (e.g. Brandeis re Ali). They have lobbied to keep law enforcement from observing activities in mosques. They have influenced the Muslim community not to cooperate with police. These tactics are similar to any totalitarian movement that wishes to suppress any criticism of their activities. Who represents Islam to the governments - city, state and federal - should be determined by the governments: they should make clear that the people who represent Muslims to these government bodies are all non-aggressive, constitution-respecting people. People [Muslims] who do not accept this arrangement will get no help, no licences to open businesses etc. "grab onto the gun and the sword and go out and do your job." If any Christian uttered such a statement, he/she would be immediately denounced as inciting 'racial' hatred and arrested and charged. Why is it that Muslim clerics can do this and get away with it? • Those who hold power – the secular leaders and clergy. This class is in it for power and not for martyrdom. These are the people who are fond of saying Muslims love death. They are not talking about their deaths – they are talking about the deaths of the tools and targets. • Those who are used to express power - the true believers and slaves. This class is simply tools. These are the people who are willing to trade their existence for the delusion of rewards in some afterlife or are willing to spend their lives in total subservience. They are used by the first class to express power and demonstrate control. • And lastly those who are not under power or control – the infidels. This class is simply targets who must either be eliminated or brought under control. Islam will not change unless enough of those in the first class - those who hold power - are either destroyed or threatened with imminent destruction. The most serious threat today is Islam. 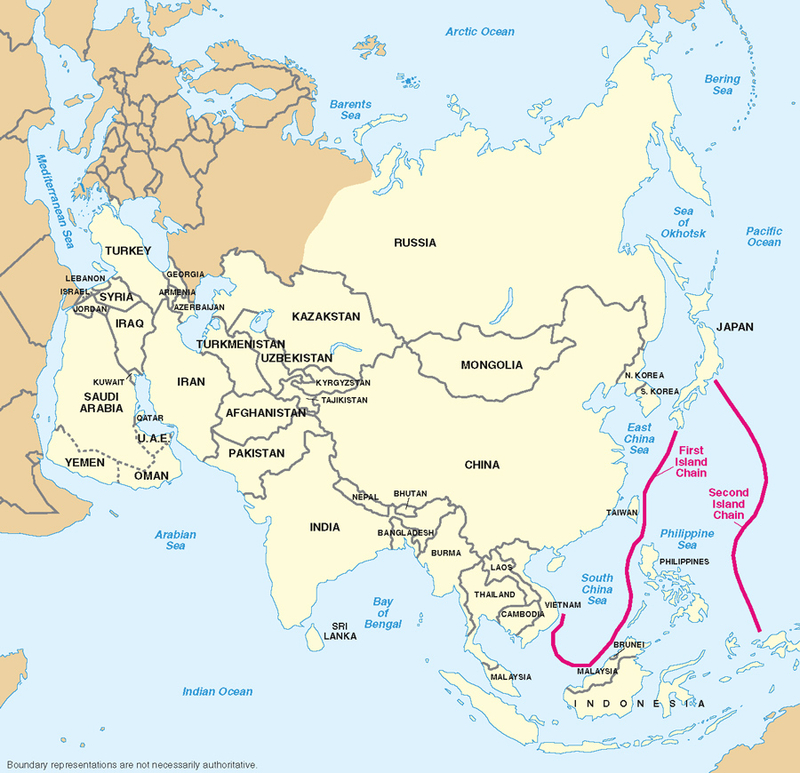 The US, EU, Russia, China, India and all non-Muslims need to unite to end it. America is riddled with foreign-supported, fifth column, Muslim organizations such as CAIR, the Muslim Students Association, etc., which will all be dealt with realistically once Trump gets into the White House. Let's make sure that he does get in. 1. "The Muslim Brotherhood's foundational texts call for the progressive moral purification of individuals and Muslim societies and their eventual political unification in a Caliphate under Sharia law. To this day the Muslim Brotherhood characterizes Western societies and liberal Muslims as decadent and immoral. It can be seen primarily as a political project." 2. "Aspects of Muslim Brotherhood ideology and tactics, in this country and overseas, are contrary to our values and have been contrary to our national interests and our national security." 3. "From its foundation the Muslim Brotherhood organized itself into a secretive 'cell' structure, with an elaborate induction and education program for new members...This clandestine, centralized and hierarchical structure persists to this day." 4. "The Hamas founding charter claims that they are the Palestinian branch of the Muslim Brotherhood and the Muslim Brotherhood treat them as such. In the past ten years support for Hamas (including in particular funding) has been an important priority for the MB in Egypt and the MB international network." 5. "From at least the 1950s the Egyptian Muslim Brotherhood also developed an international network, within and beyond the Islamic world. Europe became an important base for the growing Muslim Brotherhood global network." 6. "The wider international network of the Muslim Brotherhood now performs a range of functions. It promotes Muslim Brotherhood ideology (including through communications platforms), raises and invests funds, and provides a haven for members of the Brotherhood who have left their country of origin to continue promoting Brotherhood activity." 7. "[F]or the most part, the Muslim Brotherhood have preferred non violent incremental change on the grounds of expediency, often on the basis that political opposition will disappear when the process of Islamization is complete. But they are prepared to countenance violence—including, from time to time, terrorism—where gradualism is ineffective." 8. "Muslim Brotherhood organizations and associated in the UK have neither openly nor consistently refuted the literature of Brotherhood member Sayyid Qutb which is known to have inspired people (including in this country) to engage in terrorism." 9. "[The review] concluded that it was not possible to reconcile these [MB] views with the claim made by the Egyptian Muslim Brotherhood in their evidence to the review that 'the Muslim Brotherhood has consistently adhered to peaceful means of opposition, renouncing all forms of violence throughout its existence.'" 10. "In the 1990s the Muslim Brotherhood and their associates established public facing and apparently national organizations in the UK to promote their views. None were openly identified with the Muslim Brotherhood and membership of the Muslim Brotherhood remained (and still remains) a secret." 11. "[MB fronts] became politically active, notably in connection with Palestine and Iraq, and promoted candidates in national and local elections...sought and obtained a dialogue with Government....were active members in a security dialogue with the police." 12. "The Muslim Brotherhood have been publicly committed to political engagement in this country. Engagement with Government has at times been facilitated by what appeared to be a common agenda against al Qaida and (at least in the UK) militant Salafism. But this engagement did not take into account of Muslim Brotherhood support for a proscribed terrorist group and its views about terrorism which, in reality, are quite different from our own." 13. "Senior Muslim Brotherhood figures and associated have justified attacks against coalition forces in Iraq and Afghanistan." Well written Mr. Westrop. Hopefully US Reps. will have some backbone and acknowledge what was founded to be true of this group and endorse truth rather than political correctness. Thank you again sir. God bless & keep you. CAIR is a Muslim Brotherhood 'mb' tool, shares roots with Hamas; It also shares Hamas' methodology to dominate then dictate. 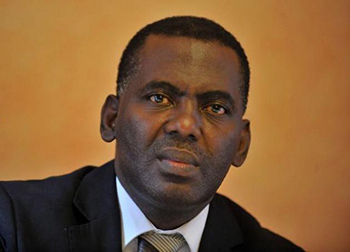 MB has been plotting to advance al Banna's dream to dominate the West indeed the world. If it has been declared a terrorist organisation by the United Arab Emirates perhaps it should be so declared in the U.S. although doubtless a dozen other terrorist-aligned groups will develop to replace them. The logical course might be to arrest and charge the leaders and, if possible, deport them.